Practically at Home: Have you been in all the states yet? Have you been in all the states yet? 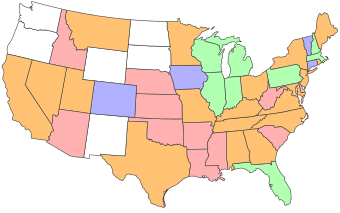 I have a few U.S. states left to visit. How about you? Maybe you’ve seen a link to this neat exercise on Facebook, Twitter, or another social networking site. It’s called the Visited States Map Generator. Here’s what my US Map looks like. Red means I've just passed through, maybe seen a thing or two. Amber means I've at least slept there and seen a few things. I have a first-hand idea of what the state is like. Blue means I've spent a good amount of time in that state. Green means I've spent a lot of time in that state, weeks at a time on multiple visits – or lived there. Try it! It’s fun, easy, quick and free. Isn’t EVERYONE a foodie on Thanksgiving?